Appeals to jewellers and the Kimberley Process to end the trade in Israeli blood diamonds documented on OpEdNew s over a month ago have been ignored. In the interim Israel launched another diamond-funded assault on Gaza, killing 174 Palestinians, including more than 100 civilians, among them at least 37 children and 14 women. Vested interests in the diamond industry navigated last week's Kimberley Process (KP) Plenary meeting in Washington D.C. through treacherous waters to calmer seas - for the moment. As a result, Israel and Zimbabwe - diamond exporting countries that stand accused of serious human rights violations - avoided potentially crippling sanctions and jewellers worldwide can breathe easier in the period leading to Christmas, the peak diamond-sales season. With the multi-billion dollar industry holed below the waterline by the re-surfacing of its menaces, blood diamonds, it needed all hands at the pumps to prevent civil society concerns about diamond-funded human rights abuses from scuttling their golden goose. The failure of the KP Plenary to broaden the definition of a "conflict diamond" to ban blood diamonds that fund human rights violations by rouge governments looked set to deliver the coup de gr- ce for the discredited KP system of self-regulation. In the end, a face-saving coup of sorts deftly smoothed the cracks and the cover-up went unnoticed by the drowsy media which largely ignored the event. Some reports regurgitated the official line without question, giving the impression that all was well, as Zimbabwe, the focus of human rights abuse allegations, was now back in the fold having met KP minimal standards. The reality, however, was that the gaping hole in the regulations that gave rise to the crisis in the KP remains wide open and KP minimal standards still don't preclude the export of diamonds that fund human rights violations by government forces. Statements from KP members hailing the fact that Zimbabwe had met minimal KP standards were a smoke screen to conceal the KPs failure to reform and to promulgate the conflict-free diamond charade. The statement by Catherine Ashton, the EU High Representative on the outcome of the Plenary amounts to blatant obfuscation and deception by omission, on a scale that questions the European Commission's commitment to the EU's founding values of democracy and respect for human rights. It is misleading for the EU to describe as "significant progress" steps taken by the Zimbabwean government to improve "KP compliance" when KP compliance does not require an end to human rights violations by member governments. The EU statement fails to alert people to the fact that and cut and polished diamonds that fund human rights violations continue to evade the regulations and remain KP compliant. The emphasis on "KP compliance" throughout the EU statement and the assertion that the KP "remains a unique tool for conflict prevention" greatly over -states the effectiveness of the KP. Rather than preventing conflict, the KP facilitates, and provides a marketing boost for, diamonds that fund violence by government forces. The "Note to editors" accompanying the EU statement compounds the deception by stating the KP " requires governments to certify that shipments of rough diamonds are conflict-free ." The KP cannot and does not certify diamonds are conflict-free as diamonds that fund human rights violations by government forces are KP compliant. It appears that some EU statements are designed to misinform rather than inform. In 2010, in response to a question from a Member of the European Parliament, Catherine Ashton, speaking on behalf of the EU Commission, stated : "KP implementation cannot be accompanied by human rights violations." Two years later, on the same day that Catherine Ashton issued the EU statement on the outcome of the KP meeting, Israel, a KP member, approved the construction of a further 3000 housing units in illegal West Bank settlements on territory recognised by the UN General Assembly as the Palestinian state less than 24 hours previously. Population transfer to occupied territory is a war crime under the Geneva Conventions. Days later the EU High Representative repeated the usual EU mantras of extreme concern and extreme worry over Israel's latest violation of international law and, also as usual, gave no indication that any sanctions would be imposed on Israel. The EU continues to allow Israel to flout EU and international agreements and regulations with impunity. The diamond industry had hoped public concern about blood diamonds and the damage caused to the diamond brand image had been contained and reversed following the introduction of the KP regulations in 2003. The regulations ban "conflict diamonds," which are narrowly defined as "rough diamonds used by rebel movements or their allies to finance conflict aimed at undermining legitimate governments." Despite their limited remit, the regulations are cynically promoted as a guarantee of a conflict-free diamond supply chain by the diamond industry, jewellers and governments -- a total fraud. That sham was laid bare when diamonds from Zimbabwe, where government forces are accused of killing 200 people, were approved for export by the KP despite protests from leading human rights groups and many in the jewellery business. Instead of an outright ban, diamonds from the Marange area of Zimbabwe were put under supervision by a KP monitoring team to ensure they complied with technical/administrative requirements of the KP regulations -- a faÃ§ade to create the illusion of KP action in response to alleged human rights violations by the Zimbabwean military for which the KP has absolutely no mandate. The Zimbabwe affair exposed a serious fault in the architecture of the Kimberley Process. The scheme, designed by the diamond industry which "provided the blueprint for the certification scheme" and rubber-stamped by the UN, has a built in by-pass which allows blood diamonds that fund human rights violations by government forces to evade scrutiny. Attempts to close the loophole were resisted by some member countries fearing any broadening of the scope of the regulations could expose their diamond industry to sanctions. Israel , the biggest beneficiary in dollar terms of the global diamond industry and the only member of the Kimberley Process that stands accused of war crimes and possible crimes against humanity by the UN Human Rights Council has most to lose if diamonds that fund human rights violations by governments are banned. Russia and China, countries with less than exemplary human rights records, also objected to the proposals. The US chair of the KP, Gillian Milovanovic twisted and turned every lever in an attempt to come up with a "conflict diamond" definition that would garner support, but her efforts were doomed. Even her tightly restricted proposal: "rough diamonds used to finance armed conflict or other situations relating to violence affecting diamond-mining areas" couldn't persuade the naysayers. African countries saw through the double-standard which targeted their diamonds while diamonds funding the Israeli regime which has a far worse human rights record would continue to be given a pass. Considering that Israel doesn't have any diamond mines some might have expected Israel to support a "conflict diamond" definition restricted to rough diamonds. But as well as being a big importer of rough diamonds Israel re-exports large quantities ($4.4 billion in 2011) of rough diamonds to Israeli companies in India and China where cheap labour makes the cutting and polishing of smaller diamonds a profitable enterprise. In the wake of the Plenary it didn't take long for accusation to surface over the KP's failure to reform. The World Diamond Council slated the US chair Ms. Milovanovic , and the US State Department, accusing them of using "divide and rule" tactics and trying to introduce a two-tier diamond market. The KP Civil Society Coalition (CSC) led by Partnership African Canada, huffed and puffed prior to the Plenary but failed to blow the house down. The CSC continues to prop-up the system, ignoring calls from members of civil society for them to follow the example of Global Witness and withdraw from the KP if it failed to ban the trade in all blood diamonds. Quoted in The Independent, the head of the British Jewellers Association (BJA), Simon Rainer, attempted to claim the high moral ground. As he explained why the BJA tells their members "don't touch Zimbabwe's diamonds" he asked : "what if a democratically elected government is using diamond wealth to suppress indigenous populations?" His concern for indigenous populations smacks of hypocrisy. Where was the BJA's concern for the plight of indigenous populations two weeks previously as Israel's diamond-funded military mercilessly rained death, destruction and terror down on the defenceless, besieged civilian residents of Gaza? 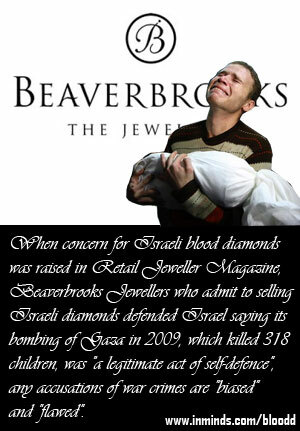 Are BJA members not selling diamonds from Israel that are funding the Israeli war machine responsible for the death and destructions in Gaza? The BJA would rather sweep those uncomfortable facts under the carpet and keep them hidden from public scrutiny. So, for this Christmas at least, most diamond-purchasers will remain blissfully unaware of the human rights violations being funded by diamonds that are labelled conflict-free even though a "great amount" of them are generating revenue used to fund the Israeli military regime which stands accused of war crimes, even before its latest pre-election murderous assault on Gaza - the largest refugee camp in the world. How many more murdered children will be laid to rest in the cold sands of Gaza before jewellers worldwide end the trade in Israeli blood diamonds? As you slept is comfort and safety last night, the diamond-funded Israeli military once again wrought havoc in Gaza, bombing it by land, sea and air, - murdering, maiming and terrorizing the besieged, defenceless people of Gaza where 20% of the population of 1.6 million people are children under the age of five. I’m listening live at 2:34 am to a Harry Fear, an English reporter in Gaza who is giving us a minute by minute account of the bombs raining down in Gaza. The building beside the one he is reporting from in Gaza has just been struck by a missile. The sound of the impact was quite audible as he broadcast. I can hear the ambulance sirens approaching. The sheer terror this Israeli action inflicts on the entire population of Gaza is difficult, if not impossible, for any of us here, so remote from the danger, to imagine. The stakes couldn't be higher for the $60 billion global diamond industry, and Israel's burgeoning diamond industry in particular, as the dynamic forces of economics, human rights, and politics careen towards a major showdown in Washington. The fallout is likely to blow the lid on a cozy cartel that has kept the scandal of cut and polished blood diamonds hidden from public scrutiny. In November members of the Kimberley Process (KP) diamond-regulatory system, ostensibly set up to end the trade in blood diamonds, will come under severe pressure to adopt a US proposal, rejected last June, which would slightly broaden of the definition of a "conflict diamond" to include rough diamonds linked to violence by government forces associated with diamond mining. The US proposal falls far short of the reforms initially sought by the KP Civil Society Coalition and other members of civil society , who want all diamonds, including cut and polished diamonds, which fund human-rights violations, to be classed as "conflict diamonds" and banned. The remit of the KP system of self-regulation, which came into force in 2003, has been severely limited from the outset when the definition of a "conflict diamond" was restricted to "rough diamonds used by rebel movements or their allies to fund violence aimed at undermining legitimate governments." This allows diamonds that fund human-rights violations by government forces, including those accused of war crimes and crimes against humanity, to evade scrutiny. In 2011 diamonds from the Marange area of Zimbabwe, where government forces are accused of human-rights violations, were deemed KP compliant and allowed enter the international market. As a result, Global Witness, the London-based human rights organizations responsible for exposing the trade in blood diamonds and a founding member of the KP, withdrew from the scheme in protest, stating: "Most consumers still cannot be sure where their diamonds come from, nor whether they are financing armed violence or abusive regimes." In a recent address to the World Diamond Congress in Mumbai the US Chair of the KP said : "Buying diamonds is an emotion-laden decision that is a choice, not a necessity. These kinds of purchases are particularly vulnerable to changes, sometimes rapid changes, in consumer sentiment." Western consumers, and increasingly so consumers in the East, have learned to consider diamonds as objects of romance and eternal love. But that romantic image was damaged when reports of diamond-funded human-rights violations gained media attention and a Hollywood film exposed the uglier side of the diamond trade. While the human-rights violations that lead to the establishment of the Kimberley Process were associated with rebel groups in Africa, recent revelations have exposed how cut and polished diamonds, sold as conflict-free diamonds in most of the world's leading jewelry outlets, are funding war crimes and possible crimes against humanity by Israeli government forces. Despite the fact that a significant percentage of cut and polished diamonds are crafted in Israel (50% in the USA) the jewelry industry has so far failed to take any action to curb the trade in these diamonds. 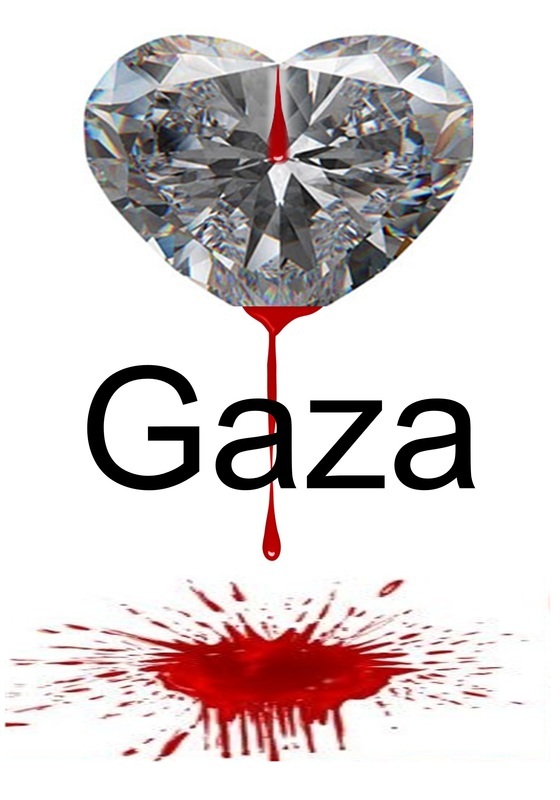 In a clear indication of the unwillingness of the diamond industry to deal with the issue of Israeli blood diamonds, it was recently reported in the Israeli media that the US Chair of the Kimberley Process, Gillian Milovanovic, had assured the industry that diamonds that fund cross-border fire between Gaza and Israel would not be banned. The double standards of the jewelry industry was evident earlier this year in an article supporting KP reform on a leading US jewelry magazine's website (JCK), which posed the question, "What if there were diamonds (either mined or imported to be cut) in Syria?" JCK Senior Editor Rob Bates ignored the fact that Israel, which illegally occupies part of Syria, is a leading player in the global diamond industry, is responsible for the proliferation of nuclear weapons in the Middle East, and stands accused of war crimes by the UN Human Rights Council. Evidence given to the London Session of the Russell Tribunal on Palestine in November 2010 by Israeli economist Shir Hever indicated that revenue from the Israeli diamond industry generates over US$1 billion per year in funding for the Israeli military/security industry. And yet jewelers facilitate the trade in Israeli diamonds, which are a major source of funding for Israel's nuclear-weapons programme and many grievous breaches of humanitarian law and international human rights laws. Any mention of the link between Israeli diamonds and war crimes is likely to result in censorship and the castigation of those who questions the ethical provenance of diamonds crafted in Israel. The editor of the leading jewelry magazine, Retail Jeweller, was forced to withdraw copies of the April 2011 edition from the Basleworld Jewelry Fair and issue an apology for publishing a "Letter of the Month" that questioned why Israeli diamonds are allowed dodge the blood-diamond rules. In recent months human-rights activists in London have been staging an on-going protest over the display, by De Beers, of a Forevermark Steinmetz diamond in the Tower of London in honor of the Queen's Diamond Jubilee. The Steinmetz Diamond Group, through the Steinmetz Foundation, adopted a Unit of the Givati Brigade of the Israeli military, which it funded and supported during the Israeli assault on Gaza in the winter of 2008/2009. That assault resulted in the death of over fourteen hundred people, including more than three hundred Palestinian children, and left thousands maimed and traumatized. A UN Human Rights Council (UNHRC) investigation concluded Israeli forces committed serious war crimes and possible crimes against humanity during the three-week assault. The Givati Brigade was directly responsible for one of the most serious examples of human-rights violations documented by human-rights groups and the UNHRC when 29 members of the Samouni family were massacred by the Brigade. When the Steinmetz Foundation's support for the Givati Brigade became public knowledge, the Foundation tried to conceal the facts by deleting from their website all reference to their funding and support for the Brigade during the assault on Gaza - but not before a screen short of the page was distributed on the internet. Against this background, leading players in the diamond industry are trying to persuade the industry to back the US proposal for Kimberley Process reform. If successful this will allow the industry to claim they have eliminated the loophole that allowed some "conflict diamonds" to evade the regulations, while at the same time the trade in cut and polished blood diamonds that fund the Israeli military regime continues unchecked. In the open letter to the jewelry industry, Matthew Runci, President and CEO of Jewellers of America, and 25 other leaders of the American jewelry industry called on companies to demonstrate their support by making a commitment that "they will not supply diamonds and diamond jewelry connected to violence or conflict in any way" and "to ask that their suppliers to not supply their businesses with diamonds and diamond jewelry connected to violence or conflict in any way." On the face of it this sounds like a comprehensive rejection of all diamonds that fund human-rights violations. However, when Matthew Runci, who is also Chairman of the Responsible Jewelry Council (RJC), and members of the RJC Management Team were notified in April 2011 about the trade in diamonds from Israel that fund human-rights violations, the Council's CEO responded on his behalf, saying the RJC "does not accept your proposition that the Israeli diamond industry, by virtue of being Israeli taxpayers, is funding human-rights violations and that, thereby, the diamonds sold by Israeli companies should be considered 'blood diamonds.'" This selective righteousness, which has plagued the Kimberley Process from the outset, will continue as long as the vested interests in the diamond industry have a veto on what is and is not a "conflict diamond". The US proposal looks set to fail as some countries see the move as an attempt to cut off diamond revenues from governments not in favour with the US and its allies. Human-rights groups are also stepping up the pressure on the KP Civil Society Coalition to demand an end to the trade in all blood diamonds, including cut and polished diamonds that fund human-rights violations. Palestinians are by far the biggest victims of blood diamond-funded violence. The diamond industry is "one of the cornerstones of the Israeli economy" and revenue from that industry is used to deny Palestinians the most basic of human rights -- the right to life. Thousands of Palestinians have been killed by Israel's diamond-funded military. Millions of Palestinians suffer daily humiliation and denial of the inalienable rights as they languish in refugee camps across the Middle East, eke out an existence under occupation and brutal subjugation in the occupied Palestinian territories, and endure discrimination in their daily lives under the apartheid regime in Israel. If the diamond industry is to restore consumer trust in diamonds it will have to tackle the issue of Israeli blood diamonds and prevent Israel from using the industry to bankroll its apartheid regime and associated daily human-rights abuses. Jewelers should not allow their business to act as an economic shield behind which Israeli blood diamonds masquerade as conflict-free diamonds. The time for action is now -- jewelers must ban the trade in all blood diamonds and not just those associated with diamond mining.